I absolutely hated it whenever we had this at home when I was a kid. I didn't like the idea of raisins with ground pork, I didn't even like ground pork to begin with! I would usually just eat the egg and rice and mix in some Knorr seasoning and that would be dinner for me. When I moved to my new place a few years ago, I got this weird craving for it. I had no clue how to make it so I called my mom's cook. She gave me a recipe, and I tweaked it to my taste. I also use ground beef, because it's sometimes pork or a mix of both. Anyhoo, here's my version of food from my childhood! Add ground beef and fry until browned. Add tomato paste, mustard and brown sugar. Cook for 5 minutes. Add beef stock and cheese. Cook there is no liquid left. Halfway through, add the raisins. 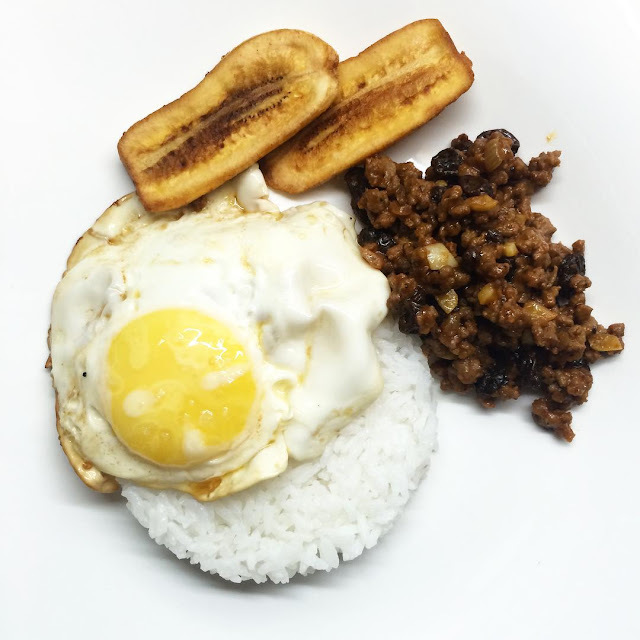 Assemble on a plate, making sure everyone has some rice, an egg, beef and banana. Alternately, you can put beef on a serving plate, put eggs on top and arrange bananas around it so people can serve themselves.